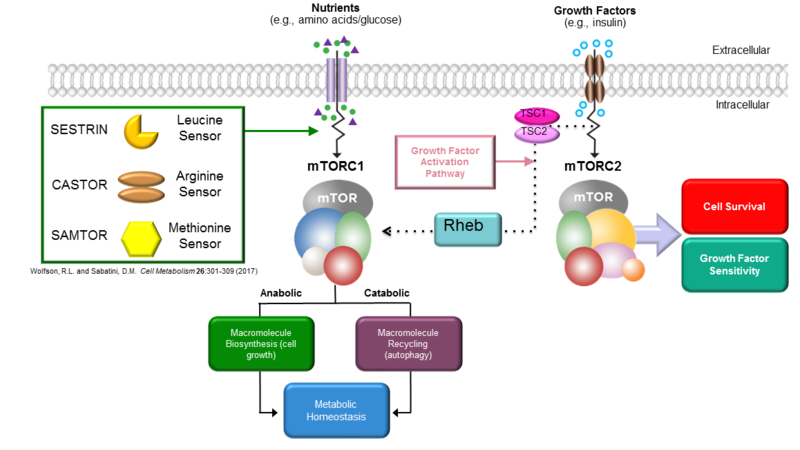 mTOR: A Master Regulator of Growth and Metabolism – Navitor Pharmaceuticals, Inc.
Navitor has deep and proprietary insights into the biological pathways that regulate mTORC1, a master regulator of cell growth and metabolism. Our novel therapeutics are designed to specifically modulate mTORC1 signaling to normalize cellular metabolic response and treat disease. The mechanistic target of rapamycin (mTOR) pathway integrates inputs from its surroundings to regulate diverse cellular processes including proliferation, growth, survival, motility, autophagy as well as protein, lipid and nucleic acid synthesis. As a central signaling hub in many central cellular processes, previous approaches to therapeutic targeting of mTOR have not achieved sufficient specificity to enable broad therapeutic application. Navitor’s unique approach selectively targets mTORC1, one of the two distinct complexes within the mTOR pathway, which is central to the cell’s ability to sense and respond to nutrients, certain growth factors as well as energy and redox status. The mTOR pathway is a central node in critically important cellular processes and is dysregulated in human diseases including depression, fibrosis, cancer and type 2 diabetes. As such it has been a significant target of interest for therapeutic intervention. While the approved drug rapamycin and various analogs (rapalogs) target mTORC1, they are complete inhibitors of the pathway and are not highly-selective for the complex with long term use. Thus, rapamycin and analogs have only been approved for a limited set of disease applications due to undesirable side effects resulting from reduced mTORC2 activity. It has become widely recognized that selective modulation of the mTOR signaling pathway (as opposed to complete inhibition) could be applied to a broader range of therapeutic applications by finding a way to selectively modulate mTORC1 without affecting mTORC2. Navitor’s proprietary understanding of the nutrient sensing pathway that selectively regulates mTORC1 activity – and the protein sensors recognizing specific nutrients that constitute this pathway – uniquely enables the discovery of therapeutics that specifically target the dysregulation of mTORC1 activity in human disease. mTOR is a kinase and the catalytic subunit of two structurally distinct complexes: mTORC1 and mTORC2. Both mTORC1 and mTORC2 are central players in an interconnected network of signaling pathways that have been linked to different aspects of cellular function. mTORC1 is primarily responsible for the regulation of cell growth and fundamental biosynthetic processes, including protein, lipid and nucleic acid synthesis as well as energy conserving functions including macroautophagy. mTORC2 is critical for maintaining the sensitivity of cells to growth factors and for overall survival.